I have confessions about my coffee consumption that I wanted to share. Mainly to defend them, otherwise, I wanted to write something non-technical related, although I believe coffee makes me a better technical person. First off, not so bad, I drink coffee from a straw when I can. Why? I think it leaves less room for error. Tilting a cup to my mouth is prone to spillage leaving my desk and clothes... ruined. Also, on the go, say in a car, tilting back the head is not safe. You lose focus on the road or even where you are walking. I learned this from a guy that drove a truck most of the day. Second, I drink stale, old, left over coffee. I brew a pot in the morning, the heat clicks off about 2 hours later, and I don't re-warm it up. Sometimes, the same coffee is left there until the next day and I drink it. I leave cups sitting around, half full (positive thinking), few hours later I see it has coffee and I hit it. I once did this overnight in the office and a co-worker brought to my attention that likely a cleaning lady sprayed chemicals near by or in the drink... I didn't care. 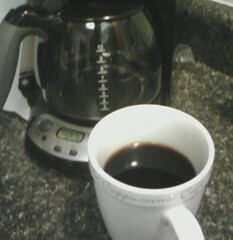 I enjoy room temperature coffee, I feel like I can taste it better. Room temperature coffee while eating or after eating is especially good. If I am lucky, I take the left over and put it in the refrigerator to chill in order to make iced coffee the next day.